squire: This week, Sam rules and Frodo drools… at least in the first two-thirds or so, which he spends more or less asleep. Then, in a remarkable burst of energy (or blood sugar), he instantly becomes Captain Frodo, and shows he’s gained considerable wisdom and dialectic agility since his last interview with a heavily armed ranger, back in Bree. An hour later, he’s sacked out and Sam takes charge again. Frodo is still sleeping at the end of the chapter. A. Does Frodo exhibit manic qualities in this chapter? Merryk: I think it's premature to say Sam has "taken charge" here. I think Tolkien is obliged to show the energy sapping toll of Frodo's burden - so letting him sit out the camp chores is merely practical. Besides, I have to think that if the author tried to let us hear Frodo's thoughts on the dead man at his feet - it would not have been as effective a moment. N.E. Brigand: What is the time? He's ever more worn down by his burden, and only manages the big decisions. Frodo after a few mouthfuls of lembas settled deep into the brown fern and went to sleep. Frodo half opened his eyes as Sam stood over him, and then he wakened from his dreaming: another gentle, unrecoverable dream of peace. squire: B. Why are Frodo’s dreams so different from his disturbing, premonitive semi-nightmares of the first book? Why didn’t Frodo dream, as far as we know, between Rivendell and here? N.E. Brigand: [modded up!] Frodo's dremes. I haven’t actually got anything interesting to say about the meaning of Frodo’s dreams, but I did find three scenes between Rivendell and Ithilien where Frodo genuinely dreams, and several other scenes where Frodo might be dreaming, or where his state is compared to a dream. Here they are in chronological order, with Frodo’s genuine dreams in boldface. A great sleepiness came over Frodo; he felt himself sinking fast into a warm and hazy dream. He thought a fire was heating his toes, and out of the shadows on the other side of the hearth he heard Bilbo's voice speaking. I don't think much of your diary, he said. Snowstorms on January the twelfth: there was no need to come back to report that! But I wanted rest and sleep, Bilbo, Frodo answered with an effort, when he felt himself shaken, and he came back painfully to wakefulness. Boromir had lifted him off the ground out of a nest of snow. His watch was nearly over, when, far off where he guessed that the western archway stood, he fancied that he could see two pale points of light, almost like luminous eyes. He started. His head had nodded. 'I must have nearly fallen asleep on guard,' he thought. 'I was on the edge of a dream.' He stood up and rubbed his eyes, and remained standing, peering into the dark, until he was relieved by Legolas. When he lay down he quickly went to sleep, but it seemed to him that the dream went on: he heard whispers, and saw the two pale points of light approaching, slowly. He woke and found that the others were speaking softly near him, and that a dim light was falling on his face. High up above the eastern archway through a shaft near the roof came a long pale gleam; and across the hall through the northern arch light also glimmered faint and distantly. Frodo sat and listened to the faint lap and gurgle of the River fretting among the tree-roots and driftwood near the shore, until his head nodded and he fell into an uneasy sleep. He sat down upon the stone and cupped his chin in his hands, staring eastwards but seeing little with his eyes. All that had happened since Bilbo left the Shire was passing through his mind, and he recalled and pondered everything that he could remember of Gandalf's words. Time went on, and still he was no nearer to a choice. Suddenly he awoke from his thoughts: a strange feeling came to him that something was behind him, that unfriendly eyes were upon him. He sprang up and turned; but all that he saw to his surprise was Boromir, and his face was smiling and kind. For a while they stood there, like men on the edge of a sleep where nightmare lurks, holding it off, though they know that they can only come to morning through the shadows. The light broadened and hardened. The gasping pits and poisonous mounds grew hideously clear. The sun was up, walking among clouds and long flags of smoke, but even the sunlight was defiled. The hobbits had no welcome for that light; unfriendly it seemed, revealing them in their helplessness – little squeaking ghosts that wandered among the ash-heaps of the Dark Lord. The day passed slowly. A great thirst troubled them, but they drank only a few drops from their bottles – last filled in the gully, which now as they looked back in thought seemed to them a place of peace and beauty. The hobbits took it in turn to watch. At first, tired as they were, neither of them could sleep at all; but as the sun far away was climbing down into slow moving cloud, Sam dozed. It was Frodo's turn to be on guard. He lay back on the slope of the pit, but that did not ease the sense of burden that was on him. He looked up at the smoke-streaked sky and saw strange phantoms, dark riding shapes, and faces out of the past. He lost count of time, hovering between sleep and waking, until forgetfulness came over him. Strangely enough, Frodo felt refreshed. He had been dreaming. The dark shadow had passed, and a fair vision had visited him in this land of disease. Nothing remained of it in his memory, yet because of it he felt glad and lighter of heart. His burden was less heavy on him. Gollum welcomed him with dog-like delight. He chuckled and chattered, cracking his long fingers, and pawing at Frodo's knees. Frodo smiled at him. "Strangely enough, Frodo felt refreshed. He had been dreaming. The dark shadow had passed, and a fair vision had visited him in this land of disease. Nothing remained of it in his memory, yet because of it he felt glad and lighter of heart. His burden was less heavy on him." give Frodo a measure of ease and comfort. I have a UUT that they are a lingering gift from Lothlorien, which means "Dreamflower". I see Galadriel as praying for Frodo to the Valar; she is watching over him in her thoughts (and mirror?). He bears gifts from her. The very cloak he wears may have been woven by her hands; the food that sustains him was made by her. So I see the good dreams as a sort of blessing from the Lady. Dernwyn: Ever since Lórien and the closer they get to Mordor, Frodo's actual dreams have been this kind: unremembered, but comforting. I was wondering the same thing: could this have been a "gift" from Galadriel, or a sign that she keeps "watch" over him, or maybe even some sort of "residual effect" from carrying her phial. an seleichan: who sent the dreams? A question might be: who sends Frodo dreams? Why does Frodo dream at any time? And why restorative dreams on the edge of Mordor, in the midst of great danger? Frodo has visions and dreams through the whole book. Sometimes they are true visions. Here, sleep and dreams are giving him rest for the journey ahead. ‘We'll finish it,' said Sam. squire: C. Frodo repeatedly cautions or tries to advise Sam here. Does Frodo expect Sam to listen? N.E. Brigand: These are mild admonitions. Frodo trusts Sam to handle the details.
. . . at times a light seemed to be shining faintly within; but now the light was even clearer and stronger. Frodo's face was peaceful, the marks of fear and care had left it; but it looked old, old and beautiful, as if the chiselling of the shaping years was now revealed in many fine lines that had before been hidden, though the identity of the face was not changed. Sam took another look at Frodo. He was still sleeping quietly, but Sam was now struck most by the leanness of his face and hands. squire: D. What is that light? Why are we seeing it now, but not anytime else since Rivendell? squire: E. This facial ‘transformation’ of Frodo’s reminds me of another similar passage in LotR: where… and why? "Then a great beauty was revealed in him, so that all who after came there looked on him in wonder; for they saw that the grace of his youth, and the valour of his manhood, and the wisdom and majesty of his age were blended together. And long there he lay, an image of the splendour of the Kings of Men in glory undimmed before the breaking of the world." It seem that in Tolkien's world these transformation occur when the spirit of the person breaks through the boundaries of the physical body. For Aragorn this doesn't occur until his death. For Frodo, his spirit seems strong enough to do so earlier, probably due to the influence of the ring. Gandalf moved his chair to the bedside, and took a good look at Frodo. The colour had come back to his face, and his eyes were clear, and fully awake and aware. He was smiling, and there seemed to be little wrong with him. But to the wizard's eye there was a faint change, just a hint as it were of transparency about him, and especially about the left hand that lay outside upon the coverlet. squire: F. Why does Frodo suddenly seem in command? Why choose “fight” since “flight” is impossible? Why pull out the swords? Merryk: I suspect without the "en guarde" gesture, they would have lost face with the Rangers. Carrying top quality weaponry of appropriate design and lineage was the equivalent of knowing a valid password. N.E. Brigand: They have no idea who these men are before they speak to them; this land seems abandoned, so they have no reason to expect to meet mostly-friendly Gondorians. "Back to back" reminds me of an earlier scene -- Weathertop? The Wargs? Moria? At once Frodo thought of Boromir, for these Men were like him in stature and bearing, and in their manner of speech. squire: G. Why is Frodo speaking the way he is? What is he telling Faramir, and what is he leaving out? Why not just say “Boromir of Minas Tirith”, for instance? Merryk: Said and not said A great admirer of the well-turned phrase, especially the extemporaneous variety, I take great pleasure in observing this perfomance. Frodo steers away from the name "Baggins" and the word "ring," while gambling (wisely) on the direction the names of "Boromir," "Aragorn" and "Imladris" would turn the discussion. Nefisa3: excellent point... that Frodo is very carefully choosing what he reveals and what he conceals, when he mentions Boromor and imladris. I always have had a credibitly problem with this spot in the story. It seems a little bit hasty on Frodo's part to blurt out so much of who he is and who he knows to strangers, no matter how tall and grey-eyed they may be. but i'm always willing to give frodo the benefit of the doubt, and this does make me think he's just smartly guessing which verbal buttons to push, that may lead them to a safe way out of this sticky situation. FarFromHome: Not said I can't help noticing that Frodo omits Gandalf's name - if he had mentioned him, it would have made things much easier, wouldn't it? This reminds me that Aragorn also fails to mention Gandalf's name when he first meets the hobbits - he gives an explanation of sorts (he wanted to be trusted for himself), but I guess in fact, the omission of Gandalf's name in both these scenes is mainly a plot device. Gandalf has a hand in everything, and is known to everyone, so mentioning him too soon would short-circuit the discussion. In this scene with Faramir, I sense great subtlety in Frodo's use of the same formal language that Faramir uses with him. This ability to speak formally when required is a strength of Frodo's, and it wins Faramir's respect - much as Aragorn's noble language (on a different level, of course) wins Eomer's. Nefisa3: or it could almost be like being a geek... you don't want to start flashing the code words of your geekdom to strangers. I could see where acutally knowing a wizard is in and of itself almost a liability; a little too much of elves and numenor and other things. So even in situations where jsut mentioning Gandalf may seem obvious, it makes sense to hold back. in the same way, us total Tolkien geeks don't let on that, say, we've read the books thrity times--this year-- or that we spent money on a Elijah Wood autograph. If someone mentions Lord of the Rings, you kinda ease into: "yeah,those were good flicks? Read the books?" in the same way, frodo is sparingly using the code words of his allegiances, but not hitting faramir with the full blast treatment. FarFromHome: Good point that Frodo maybe knows too much about Gandalf to just mention his name without thought for what it might mean to the other person. It's certainly true in LotR that the wiser you are, the less you tell. It takes Sam's accidental blurting of the truth to get past the reservations Faramir and Frodo have about confiding in each other. It's always struck me in the Bree scene, too, that although Strider avoids Gandalf's name, Butterbur comes right out and says it - and the hobbits immediately take him at face value. In fact, it often takes one of the simpler characters (Sam, Pippin, Butterbur) to say the very thing that needs to be said, while the wise are carefully keeping their own counsel. Maybe there's a lesson there for us geeks as well! Merryk: Playing it close to the vest I had always projected "deeply felt grief" over the blank spot where Gandalf's name should have been. Ever had a time in your life when it was just too hard to bring up a personal loss - especially with a stranger? Nefisa may have a better idea - didn't Gandalf imply at the Council that Denethor and he were not on the best of terms? (Note to self - check on that) Even the way he rather vaguely introduces Boromir ("I think he was from around here...") indicates a careful testing of the reception he was getting. "In former days the members of my order had been well received there [in Gondor], but Saruman most of all.... Less welcome did the Lord Denethor show me then than of old, and grudgingly he permitted me to search among his hoarded scrolls and books." So yes, there was a hint of a rift. N.E. Brigand: Well, Frodo and Sam are "travellers" (I like Brian Rosebury's description of the LotR more as a journey than a quest) but that's an incomplete statement. Their names will mean nothing to the Gondorians, so Frodo offers those, knowing it will suggest their honesty but bring them no harm. "By long ways" is vague. Frodo only bothers with the "seven companions" that Faramir might have met or heard of, guessing that they've journeyed to Minas Tirith. He knows he's on shaky ground with Boromir: he wants to use Boromir's name, but doesn't want to seem too knowledgeable, and doesn't know how Boromir reported their last meeting. ‘Are the riddling words known to you that Boromir brought to Rivendell?’ Frodo replied. Seek for the Sword that was Broken. squire: Frodo sees Faramir respond progressively to each of his statements: “starting” at the mention of Imladris; “astonished” at recognition of the dream verse; and a “thoughtful” but guarded acceptance of Frodo’s claim to be part of the prophecy. H. Is Frodo choosing and reframing his words in reaction to each of Faramir’s responses? 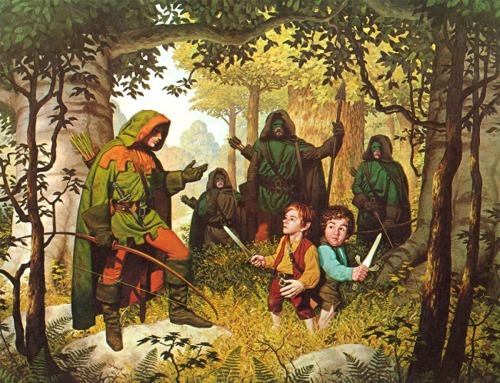 What does Frodo expect from this encounter—how is he conducting himself? N.E. Brigand: Frodo wants to seem as helpful and informative as he can. But he's had a bad experience with a noble-seeming Gondorian, and fears giving away too much. He wants to focus on the "safer" parts of the story. squire: I. “Courteous words” indeed! What does Frodo hope to accomplish by this speech? N.E. Brigand: The offer to help is nice. "Doughty men" was a phrase Boromir used of himself and Aragorn. I don't know what exactly Frodo hopes to accomplish, except that he hopes for the best possible outcome. After a while he spoke to them; but they were slow and cautious in answering. squire: J. Which Elven-tongue does Frodo know? Why does it take him so long (“became aware”) to recognize the Gondorian speech? N.E. Brigand: I think Frodo knows more Sindarin than Quenya; these men are speaking Sindarin, possibly with an accent. That accent, plus the fact that the men were speaking softly, and that Frodo was politely not trying to listen to their private conversation, explains the delay in his comprehension. squire: K. When he finally speaks to them, is it in the Common Speech, or in Elvish the way he did with Gildor? Does this scene echo the one at the doors of Edoras in any meaningful way? N.E. Brigand: Frodo speaks to them in Sindarin. Good catch on the Edoras contrast. From memory: there Gandalf asks the Rohirrim to use the Common Speech, and they note that knowledge of their language aids in admittance. Frodo earns some respect from these men by knowing their tongue. 'I do not know where he is,' said Frodo. 'He is only a chance companion met upon our road; and I am not answerable for him. If you come on him, spare him. Bring him or send him to us. He is only a wretched gangrel creature, but I have him under my care for a while. squire: L. Is Frodo “not answerable” for Gollum, or does he have him “under his care”? What is the difference between how Frodo answers this question and the others? Merryk: And he is precise, if not precisely helpful, in his description of his relationship with Gollum. He owes the creature protection (after drafting him as guide), but is aware that he is in no position to govern, or even predict, Gollum's every move. N.E. Brigand: If Gollum causes trouble, it's not Frodo's fault, but Frodo would prefer to see Gollum come to no harm. Answering this question, Frodo has a specific request of Faramir. His other responses are strictly informative.